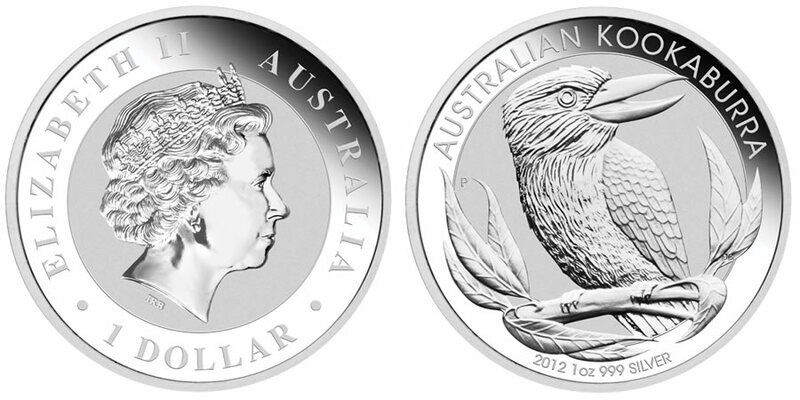 The Australian Kookaburra Silver Coin has been struck by the Perth Mint of Australia for over twenty years. It features an annually changing reverse design of the kookaburra. Native to Australia, the kookaburra's call has been used many times in the movies and televisions. It sounds extremely similar to loud human laughter and is used mainly to greet its mate after being apart for any reason. The kookaburra is carnivorous and survives on a diet of mostly small mice. However, it is also known to eat other small creatures like snakes, lizards and sometimes other small birds. The Australian Kookaburra Silver Coin was introduced in 1990 by the Perth Mint and has proved extremely successful now for over two decades. Its purity and weight is guaranteed by the Australian government. The bullion coin is available in four sizes - 1 kilo, 10 oz, 2 oz, and 1 oz. The reverse design incorporates an image of the kookaburra sitting on a branch. Encircling the bird around the top of the coin is the inscription ""Australian Kookaburra." Underneath the kookaburra are "1 oz" ( "1 oz" changes based on the size), "999 Silver" and the year.